During one of our nocturnal colloquies – if truth be told with me more than anything trying not to let her fall into one of the formidable Renaissance traps of Santa Maria Novella, nudging her along with little pats on the arm as one would with a friend – Nan Goldin cracked an enormous smile at the mention of Luigi Ontani, considering him a true artist. It’s an opinion I share without myself making any claims to being an exclusive maître à penser. It would take a good while to go fully into the matter of who is a true artist according to Nan Goldin, but with a heinous succinctness I would dare to say he who unites art and life, or rather who brings them together by adopting a coherence between thought (strong) and action. The next evening in the gallery she dwelt at length on a work by Fillippo Sciascia, even touching it, asking me several times, “Who is this?” She really liked it; she really liked it a lot. Not long had passed since the news that Luigi Ontani and Filippo Sciascia had struck up an intellectual fellowship, and still less since this intense and impressive exchange led them to do a show together in Naples at the Archaeological Museum: BaliBulè. Matahari is Filippo Sciascia’s first one-man solo project in Italy since his return home, after having harvested Asian appreciation from his base in Bali. It’s a corpus that takes its cue from the works presented in Naples with Luigi Ontani: this show in Pietrasanta represents the evolution of that series, with works specially created for the ex-Marmi. We need to bear in mind that Filippo Sciascia sees his work as a continual evolution. So much so that the catalogue features less recent works as natural connecting links, basing himself on the assumption that the quality of thought can be externalised in art in the most disparate ways and that he favours some of these, among which painting is the chief but not the only way, as we can appreciate in this show. He indeed says of it: “I did sculpture by doing painting”. Filippo Sciascia handles the conceptual approach while always keeping the painting as the core of the work, even when in terms of containment we are looking at installations and objects. Sciascia’s relationship with painting is always conditioned by the use of other media – especially cinema and photography. The ease of moving within the history of art and the quality of the relationship with the territory of life and with his own roots encourage Sciascia to practice an art that is capable of yielding the certainty of the past and a gaze towards the future, a cultured and demanding art as an antidote to allusive and unwitting maîtres-à-penser. I can grasp the closeness to Luigi Ontani. Nor would it be displeasing to Crispolti, who staunchly upheld that the capacity of an artist was to measure himself through appraisal of his ability to restore the meaning of our times and, at the same time, to influence contemporary artists. I don’t intend to go into details on either aspect. I can’t get either Pasolini or Victor Man out of my head, but I don’t want to quote them out of place. From Pasolini I would take the radicality, whereas in Victor Man what strikes me is the admiration we share for the work of the Rumanian artist. Leaving aside the formidable capacity for addressing muted colours (and for muting them), recently I laid my hands on an inspired artist’s book of his about an unknown seventeenth-century artist, with whom evidently Victor had entered into a spontaneous harmony –even more Roman than Romanian – culminating in the curious scene of the explanation by me, on his own invitation, of his works which they had just asked him about. The series of the hands was sparked by the surprising discovery of local sculptures inherently linked to the Byzantine iconographic tradition, abstract and not naturalistic, but devoid of all justifying contamination, to which he cannot of necessity be indifferent since it is ineluctably bound up with his own western legacy. It also comes from the extension of that wonderment to the iconography of the old zodiacs in which the rings of animals were arranged around men in the originals, whereas in Sciascia they move around the fingers, and hence the hand, curiously linking up with the concept of self-portrait that Sciascia resorts to: namely the hand as the principal instrument of the artist’s action, thereby restating its centrality. Sciascia’s interest in the zodiacs is none other than the continuation of his exploration of the stars, a synecdoche through which he refers to the light and the study of the same, from cinema to photography, through to the physical reaction in contact with the human perceptive process in which the pineal gland plays a decisive role. This harks back to the interest in the universe, resorting each time to expedients that are not reduced to the mere representation, for which a high-resolution photo would suffice for example. He instead follows his own temperament, drawing and painting in a classical mode, or through objects and installations that are none other than the exercise of doing sculpture through painting. 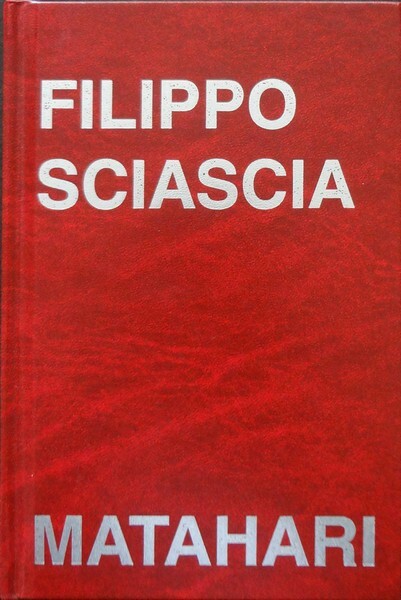 While the lesson of conceptual art manages the radicalism of thought, progressively suppressing sensitive data in the (non) formal results, Sciascia satisfies his own conceptual poetics, taking over an object and modifying its use, after Duchamp that is, but rather than through the ready-made by definition, through classical painting or the installation dimension of this, in which the draughtsmanship and the pictorial gesture are never absent. A constant shifting between western history, the origins of the artist and the reality of Bali; a world awash with spiritual conditioning where, for example, the recurrent explosion of the volcano catapults the experience of the artist into a dimension where, all of a sudden, the palms turn white as if laden with snow: the essential datum continues to be surprise, wonder. Starting from the central group of large sculptures, all the works are entitled Gremano Esiatico, sequentially numbered: in this way the artist intends to uninterruptedly condense classical Greek and Roman iconography with Indonesian spirituality, to harness the weight of the history that he comes from and which belongs to him with the everyday of one of the most spiritual places in the world. And we should remember that such pertinent adherence to this iconography was sparked by the comparison with the collection of the National Archaeological Museum of Naples, continuing then along the strand of ‘poor Baroque’, an expression Sciascia resorts to when speaking of these works that are only apparently unadorned, humble, commonplace, but actually glitter with an abundance of refined detail. The result of Sciascia’s works is the journey, the synthetic restitution that art offers, from western culture to the impact with Indonesia, more precisely with Bali, as a unique and unrepeatable moment. In Gremano Esiatico 8, for example, figures from western culture are laid upon a sculpture originating from the Island of Flores, but what is truly original is the reading through which we have to approach it. The rear of classicism is in effect the conceptual front side of the sculpture, since the leaf is the present, because it comes from Bali, its soul linked to the Hindu temple and its shape rising in corners reproduced by the lines of the leaves. This Bali motif is confirmed by the reproposal of the model of yellow and black lines that come together exactly half-way in the works on wood, in which he often inserts western icons such as Donatello’s David constructed by carving a beehive, positing dualism and oscillation between roots and territory, west and east. A propos this it is also pertinent to mention the pictorial works on panels on the model of Brunelleschi, inlaid with wood from Bali, bearing a painted portrait. Sciascia cites his being an adoptive Florentine through Brunelleschi, natural icon of the western heritage that Sciascia comes from, bringing it together with wood coming from Bali and carved there. Sciascia defines himself as a contemporary artist that looks to the past, capable of drawing on his adoptive land while valorising the western culture in which he was born and bred. Two sides coexist in these sculptures, just as duality distinguishes not only the human being (two shoulders, two eyes, two ears, two legs) but also nature in the alternation of day and night, hot and cold, rain and sun, and is indeed one of the leitmotifs of the entire show. The two sides appear everywhere: we come up against a continual symmetry, from the leaves to other motifs on wood or even on canvas. In front of the sculpture with the bells Filippo Sciascia says “It’s a bit like doing arte povera taking in the Baroque on the way”: because visually it is poor, since these are humble materials, but in actual fact they are rich in ornament and facets. One has only to look at the trunks of the sculptures, real black fern trunks that the artist collects, redolent of Greek columns, adorned and interwoven with the association with bells as objects of the ritual of prayer present in every home, so rooted is spirituality and devotion. The paintings pursue the same poetic: they are cracked to give the idea of being poor, but only visually, because in actual fact they harbour a lengthy labour of sedimentation and construction of the image. Running through the show are the concepts of duality and encounter between the western and the Asian worlds. These are implemented both through the attribution of new meaning to objects whose original purpose is altered, in association with others – in line with the need to simultaneously display on the one hand the past and western roots and on the other the contemporary and everyday spirituality of Bali – and through the juxtaposition of western iconography and material from Bali for the same conceptual satisfaction. Consider the radical choice of living in Bali, the isolation in a world marked out by the rhythms of prayer, devotion and spirituality, by the bells and the shrines in every home. I like for example to think of the work in barbed wire with seahorses, Gremano Esiatico 35: on the stalls of the Bali markets the barbed wire is coiled in bundles. The iconography recalls the passion of Christ, but in Bali no-one pays any attention to this detail, which instead leads Filippo Sciascia to garner that charge of significance and overturn it into a pagan dimension, redesigning the contours by using real seahorses – symbol of the god of the sea for both Asian and Greek culture – hence underscoring the dual polarity of the show: Asian culture and classical culture. The same holds for the work done with the bamboo basket used to carry the dead, its use altered to contain a new meaning: a face is applied above the centre of the basket, opened up like a surface and freed from the interlacings, a face like the sun, which in Balinese is Mata Hari, that is the eye of the dawn and hence the sun, expression of a particularly spiritual language that gives its title to this new project. For some months Hermann Rorschach has been attracting the attention of Filippo Sciascia. The famous psychiatrist who in the early years of the last century based his analyses of patients’ pathologies on the sensations that they displayed in response to different inkblots shown to them. 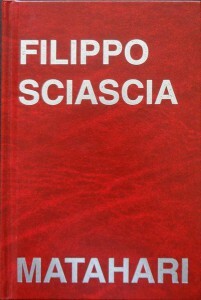 The exploration of these aspects connected with perception, to which Sciascia is still devoting precise study, is another of the subjects explored in this project in which we find works where the manifest figurative datum is suspended in favour of compositions in which the naturalistic references are muffled.